It appears the Mizrachi brothers’ Poker-quartet will have to make room for a fifth member, as Lily Mizrachi –the wife of Mike “The Grinder” Mizrachi— pocketed an impressive $140,000 this Sunday by finishing second in the Full Tilt Poker Sunday Million tournament. 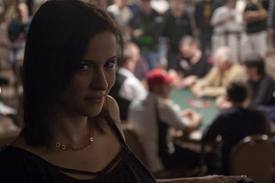 Lily Mizrachi plays under the screen-name ‘missgrinder’ at Full Tilt Poker, and fell just one spot short of cashing for the top-prize of $230,000 which went to a player by the name of dlanger610. ‘missgrinder’ hit her Twitter account soon after her biggest cash to date, tweeting, “came in second place 144k no to shabby … hope my hubby is proud :)” And I’m sure he is! I know I’d be a bit excited to come home and find out there is an extra $140k coming into the house just before Christmas! While Lily Mizrachi is no stranger to a poker table having competed in a number of events over the years, this is the first time she has cashed for any serious amount of money. This entry was posted on Tuesday, December 21st, 2010 at 7:06 am and is filed under Poker News. You can follow any responses to this entry through the RSS 2.0 feed. You can leave a response, or trackback from your own site.